I was just relaxing on my couch, watching TV. My dogs were sitting beside me, Paris happily chewing on her Nylabone when I saw them. At least 10 little brown dots frolicking on Paris' neck. Leaning in for a closer look I shreiked "FLEA. PARIS HAD FLEAS. ERIC! PARIS HAS FLEAS!!!" Eww. I jumped up, panicing, franticly searching for my cat's flea spray. It took me a while to find it. All the dogs got coated in it, and tomorrow they will all get the meds. I think Remy brought it into the house, because he just got here today, and suddenly I find lots of fleas on all my dogs he played with. I just felt something crawling on my back and I reached back and picked off a flea. Eww. They are all over me. 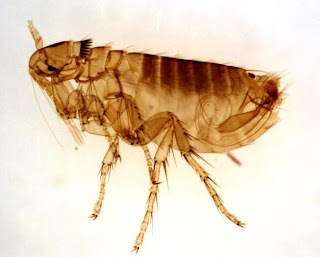 I can't believe my dogs are infested with fleas, I take such good care of them. They are very clean. I just want to cry. I feel like they are all over me, everywhere. I feel itchy all over. This is horrible. I am showering now. Today I went to the city to get my passport. I stopped in at Petcetra, hoping to get a harness for Remy. I didn't find one, but I did find a really great deal. 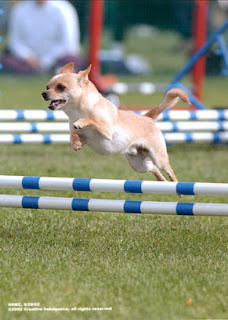 I have always wanted to do agility with my dogs, but the supplies are so expensive. While I was browsing, I saw a great agility starter kit, but it was 60 bucks, so I thought to myself I would like to buy that someday cuz it is pretty cheap for a starter kits. The tunnel alone can be 35 bucks. As I was thinking that, I looked up at the sign above them and saw "50% off. $29.95" Well, I can't pass that up. So i bought it and set it up as soon and I got home. I have ran Maeve and Paris through it already. Maeve had lots on fun and got really hyper. Paris also really loved it, and she even started to get the weave poles. Maeve has not got that yet. I can't want to do more. Eric is going to build me the A-frame, a pause table and the dogwalk! I love it so much already. It is a great way to exersice my dogs (and myself) and have fun with them as well. I AM GOING TO SHOWER NOW.....ewwwwwww.